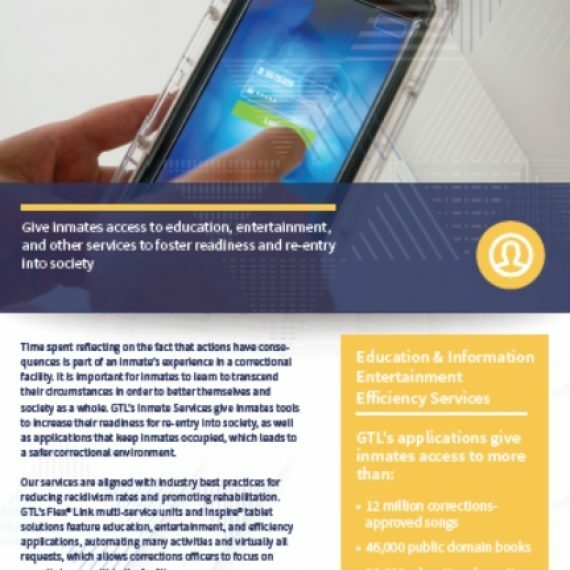 GTL Inspire tablets provide a complete communication, entertainment, efficiency, and education solution to correctional facilities. Tablets help calm the corrections environment, resulting in an inmate population that is more tranquil, less anxious, and less aggressive. Tablets allow inmates to take on responsibility, such as submitting requests and filing electronic grievances, and allow facilities to focus on operational efficiencies instead of paper forms. Inspire tablets offer inmates higher levels of educational opportunities and communication with loved ones, which have been shown to have positive effects on reducing the recidivism rate. Inspire can help prepare inmates for life after release, increasing the likelihood that they will become contributing members of society. DOCUMENTS, REQUESTS, GRIEVANCES, COMMISSARY Paperless and customizable solutions save staff time, eliminate human error, and expedite processes. VIDEO VISITS, PHONE CALLS, AND MESSAGING (including photo and video attachments) Communication options provide productive and innovative ways for inmates to stay connected with friends and family. EDUCATIONAL CONTENT Educational videos, exercises, courses, and more help inmates transition into the next phase of their lives, secure employment, and break the cycle of reincarceration. JOB & LIFE SKILLS The Learning Management System features content designed to help inmates prepare for work and relationships on the outside. MULTIMEDIA CONTENT Games, music, movies, newsfeed, books, and more reduce stress and keep inmates engaged. LAW LIBRARY Electronic law library provides access to research material while reducing inmate movement around the facility. EBOOKS Tens of thousands of eBooks with titles covering fiction, religion, addiction, recovery, and more. AVAILABLE TO EVERY INMATE Inspire offers both free and premium content for inmates on flexible payment models. DESIGNED FOR THE CORRECTIONS ENVIRONMENT Inspire tablets have a multi-layered security architecture that allows for inmates to access locked-down content without navigating to tablet settings or the Internet. 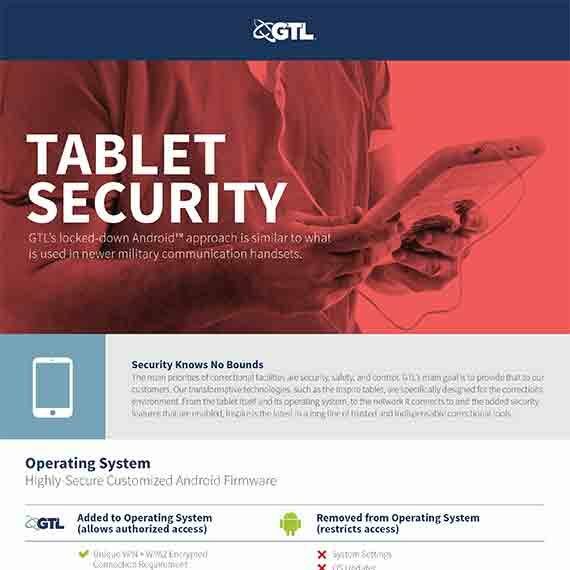 PROPRIETARY WIRELESS NETWORK At the heart of the Inspire tablet’s network security is GTL Gatekeeper – a full featured security access control software. ULTRA-SECURE, LOCKED-DOWN DEVICES Inspire uses a highly-secure, customized Android operating system that has been modified to permanently remove features that could present potential security risks. Inmates have no access to core device settings other than volume, rotation, and brightness control. INDUCTIVE CHARGING Inspire tablets offer multiple unique charging methods, including wireless charging, to ensure that they are always ready for use. AUTOMATES AND DIGITIZES FACILITY SYSTEMS Inspire tablets help facilities go paperless and automate costly processes such as grievances, requests, and commissary ordering. A NEW DATA GATHERING TOUCH POINT Inspire adds a valuable touch point to the GTL communications platform, offering new insight into inmate activity. SECURITY AND CONTROL Inspire reduces the opportunity to distribute contraband and improves facility security by reducing the need for inmate movement. OPERATIONAL EFFICIENCIES Inspire helps automate repetitive high-cost administrative tasks, allowing staff more time to focus on what’s important – security and control. IMPROVED INMATE BEHAVIOR Facilities that have deployed tablets have noted decreases in inmate-on-inmate violence, inmate-on-staff assaults, and behavior code violations. BUILDING RESPONSIBILITY AND REDUCING RISK When inmates use Inspire tablets, they regain small, safe areas of choice and responsibility, which promotes positive behavior, has a calming effect on inmate social dynamics, and reduces overall risk for staff. REDUCING PRESSURE AND STRESS Inspire settles the corrections environment by helping inmates turn long stretches of idle, negative time into active, engaging, and constructive time. REDUCING RECIDIVISM Access to increased communication and educational opportunities are proven methods for reducing recidivism rates and enabling more successful re-entry into society. Become a subject matter expert and learn how to modernize your agency’s inmate correspondences. 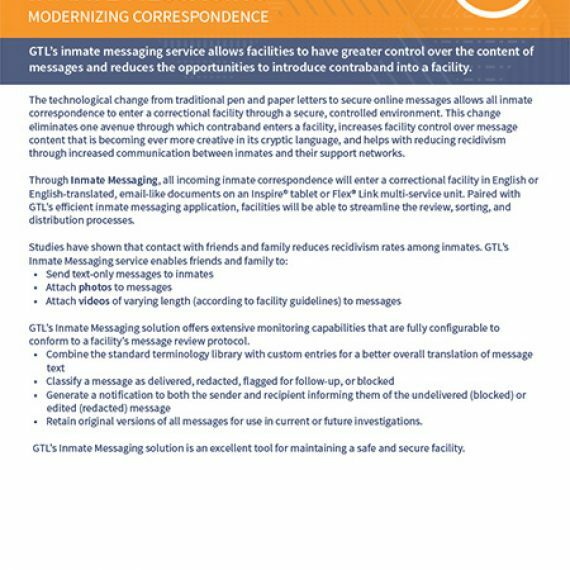 In this webinar, we’ll demonstrate how GTL’s Inmate Messaging is the 21st-century alternative to traditional pen and paper letters. This solution provides an electronic alternative to combat the inundation of paper letters to the mail-room. It has the benefits of creating a more efficient, secure, and controlled environment for your agency and staff. Inmate Messaging’s extensive monitoring capabilities are fully configurable to an agency’s message review protocol, allowing you greater control over the content of messages, reducing the opportunities to introduce contraband into the facility, and much more. Learn about the GTL Learning Management System (LMS) and how you can educate both inmates and staff efficiently using this system and the GTL tablet program together. Our presenter will be Kelly Lindman. Kelly has extensive experience in creating and managing mobile websites and applications. She has been instrumental at GTL, managing our Inmate Services Platforms and the launch of our latest Photo and Video attachment product within Messaging. Prior to GTL she was a Product Manager for Target Corporation, launching their first iPhone and iPad apps, and growing their Cartwheel application to 14 million users.